The priceless Paris landmark went up in flames on Monday evening, with the battle to extinguish the blaze taking nine hours. eBay's administrators have stepped in to take down multiple "section of timber" listings claimed to be the remains of the Notre Dame Cathedral, seemingly demonstrating that no event or object is too sacrosanct for someone to try to make a buck off of it. Along with the "embers," which went on sale starting at £0.99, the auction site took down over a dozen listings of shirt designs featuring the 'Je Suis Notre Dame' slogan slapped across the chest area, or silhouettes of the cathedral draped in the colours of the French flag. eBay took down the listings under its policy prohibiting efforts to "profit from human tragedy or suffering." Only items judged to have a "substantial social, artistic, or political value," or listings by charity groups promising to give proceeds to the disaster's victims, are permissible, according to the company. Several other listings attempting to profit off the fire were found, including a so-called "Vintage Notre Dame Paris Destroyed By Fire Metal Souvenier Building Figurine," featuring what appears to be an ordinary Notre Dame tourist trinket, but at an inflated price. eBay warned users who posted the offending listings, and threatened to suspend accounts of those who try to post them again. Online, some were shocked after finding out about the eBay listings, saying that anyone seeking to make a profit from the Notre Dame tragedy should be ashamed of themselves. — erica mcalpine (@Gunnerchica) 16 апреля 2019 г. — lauren Corey (@LaurenCBooth86) 16 апреля 2019 г. Others were more cynical, however, saying it's not like the Catholic Church "never made money from [selling] fake objects," or accusing the "PC Brigade" of stifling "entrepreneurship." — Anthony Collins (@AnthonyEdPsych) 16 апреля 2019 г. Yet another example of entrepreneurship being stifled by the so called 'PC Brigade'. — Rick Fott 🎩☝️🏆 (@ghoticake) 16 апреля 2019 г. — Julian (@juliandean12) 16 апреля 2019 г. 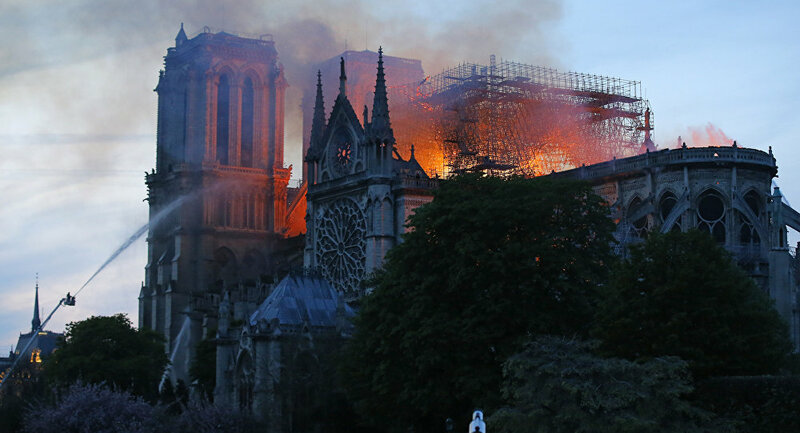 The Notre Dame Cathedral, one of Paris's most widely recognised landmarks, went up in flames on Monday evening, burning into the early hours of Tuesday morning. The cathedral, built between the 12th and 14th centuries, was the site of royal marriages, coronations, and farewell ceremonies for prominent French officials over many centuries, and is a prime example of French gothic architecture. The church was undergoing restoration work when the fire broke out. Authorities are treating the blaze as an accident.